(In Rivendell) Frodo: "You want to see some Elf magic Sam? Aragorn told me if we lift this weird cover up, a beautiful elvish maid will jump out. Sam: "Do you think Elrond will notice that we broke it?" Frodo: "What do you mean we? I told you not to take it off of it's base!" The team of Elijah Wood and Sean Astin in the semi-final round of the cast tounament of "Elvish Foos Ball," managing to control several spining rings to keep a ball within the sphere for 7 minutes 39 seconds. 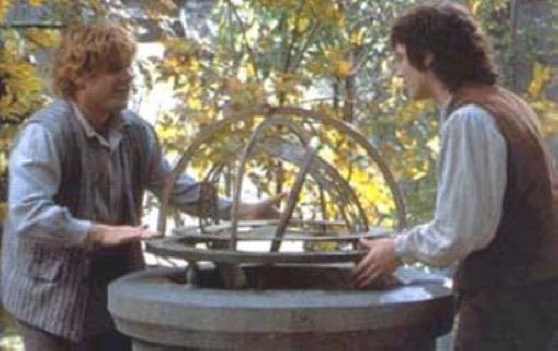 Sam: "No matter how much I practice, I just can't get the hang of this Elvish pinball, Mr Frodo!" Sam: "This looks like something to tell time with. Frodo: "Yes, Sam, it does!" Sam: " I over heard somebody talking about some girl with a strange name of Hermione that has a special necklace! She told someone it is a "Time Turner" that makes her travel back and forth in time! Do you think this a large one, Mr. Frodo?" Frodo: I'm not telling Elrond we broke his thingamajig! You tell him, Sam! Sam: Let's tell him Pippin broke it! 'Fool of a Took'! !